This was my day one in Santa Fe. 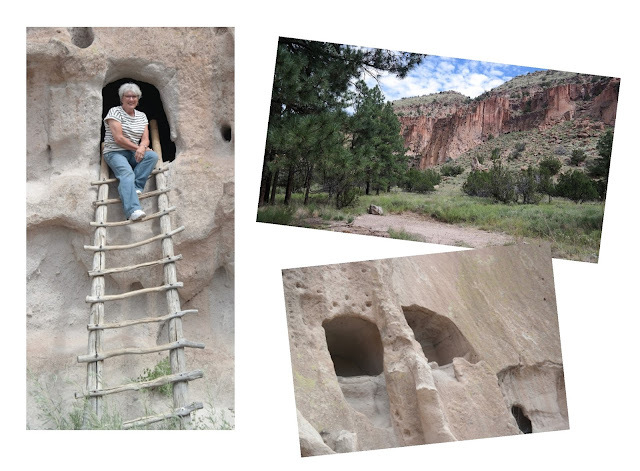 Bandelier National Monument is about an hours drive north of Santa Fe and just gorgeous. Bandelier National Monument - From the visitor's center I took a 1.2 mile hike through Frijoles Canyon's archaeological excavation site, complete with a pueblo village and cliff dwellings. There are ladders set up so you can climb inside and look out, pretending to be an Indian scouting out the countryside from on high. Imagine living here as the Anasazi Indians did, hauling wood, water and babies up to your cave dwelling on the side of this magnificent cliff. What a breathtaking sight. The photo was taken by a fellow sight sightseers that morning - I took a photo of them and they returned the favor. You always have to be prepared to interact. I am happy they were there.